Here's my 16th postcard for The Craft Barn's Quotes and Lyrics Challenge where the words this fortnight are FAMILY and/or THING. Quite a lot to choose from but again I went with the first quote that made me smile and popped an image into my head. I've sprayed my postcard with Citrus Orange, Citrus Lime and Golden Oak Inks in a Bottle and just mopped up a little extra green too. 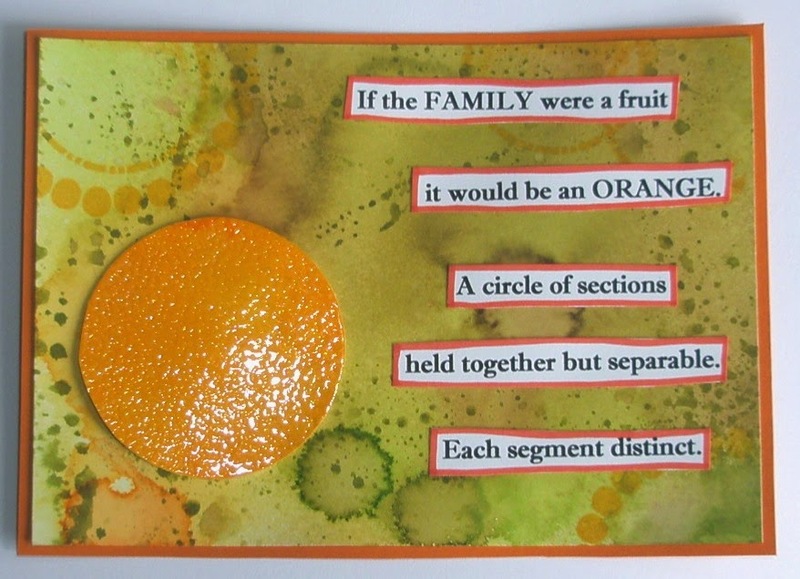 The orange I made using a large solid Journalling Circle (from Oak House Studio) inked with orange and clear embossed. Don't you just love that orange peel effect from the embossing powder! To finish I've added a few more circles and the quote from Letty Cottin Pogrebin - no, I've never heard of her either but it's a good quote. Thanks for visiting and please feel free to leave a comment - they are always very much appreciated. BEAUTIFUL! LOVE that orange! Great quote and very true as well! That orange looks REAL. Really real. You did an excellent job paring that quote with the fabulous artwork. What a fantastic page, love your quote and how you have brought it to life. Your orange circle really is very life like and has amazing texture. That orange looks ready to eat! Fabulous! I had not heard that quote before--you did a great job of illustrating it! Love the quote and such a realistic orange. I like the splattered background and the orange is just superb. The orange with its realistic orange peel is such a clever idea. It also illustrate the quote perfectly. A great quote and a wonderful piece. Love the orange, it looks fantastic. I love the way you put this page together. A great quote on a fabulous background. The orange looks very realistic.